On July 9th, we featured a CLA poster on electronic textbooks – today we’ve got another one that relates to mobile devices in the classroom. 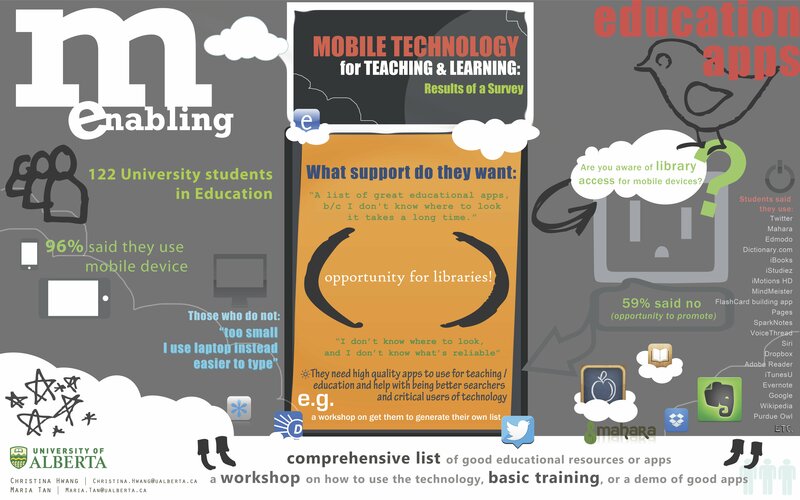 This poster “Mobile Education” was developed by Christina Hwang and Maria Tan of the University of Alberta. What they found was quite definitive – of the students that were surveyed, 96% use mobile devices and the rest use a laptop. Academic Institutions need to offer their services virtually through apps that can be accessed via mobile devices. The same goes for libraries. The University of Alberta led the way in 2011, being one of the larger academic institutions to initiate Google Apps for Education, offering faculty, staff and students virtual access to timetables, scheduling meetings, booking rooms, email, cloud-based storage, groups, calendars and the ability to collaborate virtually on projects. When it comes to libraries though – many students were unaware that they could access their school’s library through their mobile device. This should be seen as an opportunity for the library to promote awareness of the mobile access to library resources and services.